This Review Syndication Platform has the Largest Distribution Network. Check it out! Usually, when people talk about online review platforms, they talk about Yelp, TripAdvisor and Google. These free platforms are great, and we encourage you as a business owner to claim your listing today. However, for services that really rock when it comes to online reviews, you need something else entirely. One of the review syndication networks that we recommend in this regard is Shopper Approved. Of course, Shopper Approved does not come free of charge (though it is very affordable), but signing up with this review syndication platform truly turns online reviews into one of your company’s biggest assets. To say that online reviews are everywhere is something of an understatement. From Search Engines to Online Reputation Management companies and Social Media platforms, there is no end to the places where your customers can go to leave a review about your business. This makes it important for you, as a business, to make sure that you have all the angles covered as far as monitoring and managing mentions of your brand online. You cannot, as an example, rely on a platform such as Yelp alone. Though Yelp is great for collecting reviews from your customers, one of the things that you will realize is that social media, particularly Facebook, has actually become even bigger when it comes to the reviews. This applies whether or not you have chosen to create a Facebook Page for your business. Online reviews are, as we have already noted, one of your company’s biggest assets. However, in order to make them great, you need to sign up with a company that makes sure that the feedback that you gather from your customers is distributed to the biggest possible audience. This is where review syndication companies such as Shopper Approved come into play. Instead of merely gathering reviews from your customers, these companies go beyond that to push them to a wide range of platforms, giving you the kind of visibility that you need in order to generate better qualified leads. There are several reasons why the above platforms matter when it comes to giving your brand greater online visibility. Google, Bing and Yahoo are some of the biggest Search Engines that can be found out there. YouTube, on the other hand, is the biggest video site that’s on the internet today. Indeed, you may not be aware of the fact that YouTube is only surpassed by Google as far as online queries are concerned. It is, therefore, a platform on which you need to be very active as a business. Facebook and Twitter are among the top Social Media platforms that can be found in the world. Indeed, Facebook boasts of a massive 1.2 billion monthly active users, making it the go to place for those that wish to give their business greater visibility. If you have been going online for any given amount of time, you will have noticed star rating extensions. This five star based system appears in Google PLAs and Google Shopping and is used as a guide to consumers of the kind of feedback that a business has received from its users. Star Rating extensions are one of the reasons why online reviews matter so much. What most people do not know is that Google gets the data that it uses for star rating extensions from a few licensed companies. Shopper Approved is one of these companies. What it means in practice is that when you get five star reviews from your customers, Shopper Approved pushes this feedback to Google, thus allowing you to get the seller and product ratings that most businesses are on the hunt for. So, why are star rating extensions important? Well, how about the fact that they, according to Google, contribute to an increase in CRT of up to 17% in Google Ads? Another thing that makes Shopper Approved great is that it gives you the ability to take advantage of the power of local reviews. Local reviews are reviews that you gather either within your business or on the go. The great thing about them is that they contribute a lot to your business’ visibility in local Search. Take Google as an example. Over the past few years, the world’s largest search engine has taken to prioritizing local results for local queries. 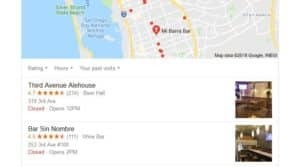 What this means is that when you, as an example, search for a “bar near me,” you get results of business that are nearby. Not only that, but these results also have reviews in the form of star ratings, highlighting the kind of experience that people have had with the various relevant establishments that are nearby. When it comes to gathering and managing online reviews, no company does it better than Shopper Approved. This is a company with which you need to sign up right now. The good news is that you can do it at a discount should you choose to use our link. Not only that, but you also get the first 2 months absolutely free of charge. So, what are you waiting for? 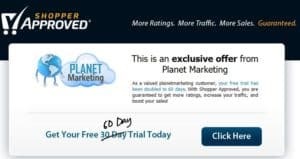 Get your Shopper Approved 2 months trial right now!